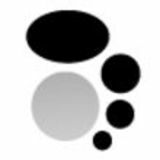 Founded in 1955 by Robert Welch, Robert Welch Designs is a family run business based at Chipping Campden in the Cotswolds. Originally Robert Welch set up as a designer for industry from his workshop in Chipping Campden and from his base opened a shop to sell his own designs. Over the last fifteen years his family â&#x20AC;&#x201C; Rupert Welch and Alice Welch (Directors) have expanded the business to supply hospitality customers with a multi award-winning collection of internationally renowned cutlery and tabletop items. Finish:	Bright Gauge:	3.5mm All items in this range are non-stock. All items in this range are non-stock. Stock - Lead time maximum 20 working days. Non stock - Lead time maximum 25 working days. Finish:	Bright Gauge:	5mm All items in this range are non-stock. Finish:	Bright/Vintage Gauge:	3.5mm * Indicates Bright stocked items. All Vintage items in this range are non-stock. * Indicates Bright stocked items. All Vintage items in this range are non-stock. Stock - Lead time maximum 20 working days. Non stock - Lead time maximum 25 working days. Finish:	Bright Hammered Gauge:	5mm * Indicates stocked items. * Indicates stocked items. Stock - Lead time maximum 20 working days. Non stock - Lead time maximum 25 working days. Finish:	Bright Gauge:	3.5mm * Indicates stocked items. Finish:	Bright/Satin Gauge:	5mm * Indicates Bright stocked items. All Satin items in this range are non-stock. * Indicates Bright stocked items. All Satin items in this range are non-stock. Stock - Lead time maximum 20 working days. Non stock - Lead time maximum 25 working days. Finish:	Bright/Satin Gauge:	4mm * Indicates Bright stocked items. All Satin items in this range are non-stock. Finish:	Bright Gauge:	N/A * Indicates stocked items. All items in this range are non-stock. Designed with the aid of professional chefs and with comfort in mind, each knife has been purposefully designed for its specific task and diligently tested. These multi-award winning Signature knives and accessories are ergonomically shaped for maximum control and ease of use. Perfect for any venue Introducing the Folio Collection; a contemporary assortment of cutlery that is perfect for any size operator. Conveniently priced with the operators in mind, this collection features clean, sleek lines and boasts an 18/10 stainless steel finish. Folio cutlery provides excellent stain and rust resistance with a long lasting shine, making it a great choice for your banqueting and dining needs. NEW RANGE Simple, yet timeless, the high quality mirror finish of Hartman provides a look that is ideal for any venue. All items in this range are stocked. Stock - Lead time maximum 20 working days. NEW RANGE A beautiful mirrored hammered pattern that is whimsical and bold. Designed specifically for the hospitality industry The Varick Collection includes patterns made from 18/0 stainless steel, all exceptionally priced for value-conscious operators. Top-grade hand polishing provides a superior soft shine, while proper weight distribution and balance provides a comfortable feel when handling. Complete with a collection of steak knives, Varick cutlery is dishwasher safe and offers a breadth of patterns at an affordable price, making it the ideal choice for the hospitality industry. 18/0 cutlery which is exceptionally priced for value-conscious operators. Varick cutlery provides excellent stain and rust resistance, all the while being commercial dishwasher safe, making it the ideal choice for the hospitality industry. Available in various handle options and either sharpened or serrated, round or pointed blades. Varick steak knives add that “something extra” to tabletop presentations. Sharpened to perfection, the stainless steel cheese knives by Jean Dubost are a beautiful accessory to any buffet presentation. Available in four different shapes, the knives are a great mix and match, and the vintage finish provides a trendy, contemporary look. Features & Benefits For every meal and culinary occasion there is the opportunity to add that extra individual touch. Cutlery pieces that are designed for specific purpose are details which can make a real difference. 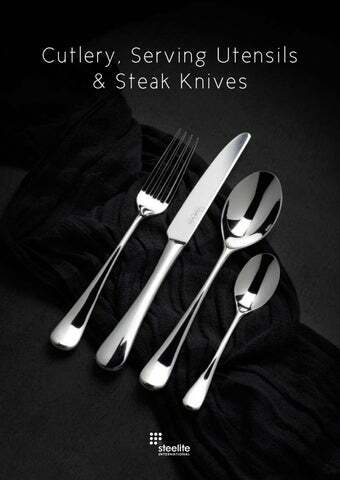 Robert Welch Robert Welch cutlery collections feature enduring and timeless designs, designed for comfort. Beautifully balanced and weighted, all spoons and forks are made from the finest German 18/10 stainless steel. Knives are forged from a single ingot of especially hardened stainless steel in order to maintain a cutting edge. All Robert Welch patterns are covered by a lifetime warranty, giving you further confidence that your cutlery with withstand the test of time. Folio Steeliteâ&#x20AC;&#x2122;s 18/10 Folio collections are exceptionally priced for value-conscious operators. Top-grade hand polishing provides a superior soft shine, while weight distribution and balance provides a comfortable feel when handling. Folio cutlery provides excellent stain and rust resistance, all the while being commercial dishwasher safe. Varick Crafted from 18/0 stainless steel, Steeliteâ&#x20AC;&#x2122;s Varick ranges provide good strength, high shine and excellent stain resistance. Laguiole Each Laguiole steak knife is subject to a special firing process, providing ultimate blade flexibility.